"What they're doing down there is mourning. As millions of people across the infinitude of the grid shall always be mourning, coping with every imaginable variation of loss. Every loss deserves a telling." 8-11 was the day that changed everything. Twenty-year-old Skylar was watching from her apartment window when she noticed the object falling from the sky. Before she could reach the young boy she was babysitting, the night's sky was illuminated by the brilliant flash of the mass impacting the earth. The Golden Gate Bridge was reduced to rubble, and a haze of ash and debris enveloped the city. As soon as she ascended to the chaos on the streets, Skylar's fate was sealed. The toxic air polluted her lungs and she, like so many others that day, fell victim to the catastrophic tragedy. Several years later the world is still coping with the effects of that incident. Authorities were never able to determine what exactly caused the disaster and have no idea who, if anyone, was responsible for the attack. Some claim that the object was a missal or a bomb. Others swear it was an object from outer space. In the end, whatever the object was doesn't really matter. The events of that day have caused an immense shift in the daily lives of everyday people. They now, "live, day to day, with the chance of something violent, something tragic happening at any moment. "Motivated by this constant fear, post-incident America has responded in a historically misguided way. Much like Japanese Americans after the bombing of Pearl Harbor, Muslim Americans have been corralled into camps. As Americans search for any scapegoat to place their anger and grief upon, Muslims become the victims of hate and distrust. Skylar's family has found her death to be unbearable. So much so that her parents, Mitch and Kathryn, have erased any trace of their deceased daughter. Whether they have done this consciously or not is unclear, but they constantly tell their youngest son, Dorian, that he does not and has never had a sister. Dorian was a toddler on 8-11, so he has no recollection of Skylar. But the young man is beginning to suspect that his parents are hiding something from him. He has vivid dreams of a young woman watching a blinding flash from an apartment window in the city. His parents refuse to acknowledge any questions about the girl, but Dorian persists that evidence of a sister must exist somewhere. Dorian's life becomes even further conflicted when his elderly neighbor introduces a young boy, Karim, who he has adopted from one of the Muslim camps. Dorian is instantly filled with hate for the boy. "Hating . . . not him exactly, but the idea of him, or the idea of people like him -- and though he has been taught to not believe in the sameness of all such persons, a logic as inborn as the structure of his DNA connect each and every one of them. . ."
Karim is equally troubled with his new life. In the camps, he was indoctrinated with the teachings of self-sacrifice to reach eternal paradise. The Sheik had Karim memorize a number that he was to use to contact the camp after he settled into his new home. Once contact was established, Karim would begin the process of planning for a suicide bombing mission. But as he assimilates to his current situation, Karim begins to realize that he may have more similarities than differences with the people he has been taught to hate. 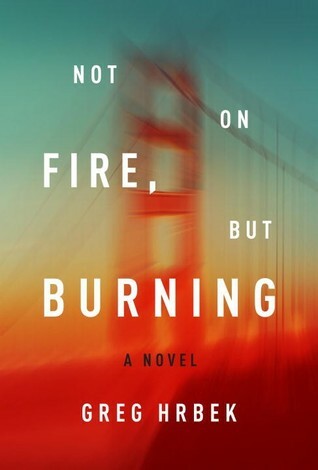 In Not on Fire, but Burning, author Greg Hrbek explores the ways in which people deal with the grief and fear that comes from loss. He changes between first and third person point of view as each of the characters are explored. At first, this can be a bit disconcerting, but the changing perspectives soon fall into a steady rhythm that allows for a breezy pace. By shifting to the different characters, Hrbek provides intimate insight into each of their situations. While they are all connected as participants in the main narrative, the characters are further united by the same internal conflict. Each character is trying to reconcile societal decorum with their own conscience. This makes for a layered drama that delves beyond the main story. Through this extensive character study and an almost poetic prose, Hrbek crafts an exquisite novel that works as a metaphor to America's reaction to the events of 9/11 and a stunning exploration of the human reaction to tragedy. This entry was posted on Tuesday, September 22, 2015 and is filed under America,Book Review,disaster,Drama,Family,Greg Hrbek,Grief,Literature,loss,Love,Not on Fire but Burning,Terrorist. You can follow any responses to this entry through the RSS 2.0. You can leave a response. Oh wow, this sounds like such a heavy book which does the details well of going into each and everything character and really bringing up the emotions he is trying to focus on. Wow. This is one of those cases where the few short paragraphs I've written can never adequately portray the depth and brilliance of the novel. You simply must experience this one for yourself! It is 100% worth it!